Soho style: Lim by a wall-sized artist impression of Tigaman Square. He says a predominantly industrial area would augur well for a retail outlet. Sunhor Property Bhd group managing director C.T. Lim is ready to face challenges in his company's maiden commercial development in Bukit Kemuning, Shah Alam. The bottom three levels feature retail units, followed by two levels of parking space, and one level of office suites with a Soho concept. The “pull factor” will be the retail outlets, which Lim hopes will turn Tigaman Square into a trendy shopping spot and Bukit Kemuning into a vibrant business and social venue. But sceptics doubt that the project will be able to woo tenants, given the profile of its immediate surroundings, which comprise mostly industrial lots and the lack of a strong population to support the retail portion of the development. Lim, however, remains optimistic. He believes that the challenges the Tigaman Square development faces involve where the project's opportunities lie. “People say that it's mainly an industrial area and that the population is not sufficient to support commercial development, especially for shopping or retail outlets,” Lim tells StarBizweek. Citing a recent demographic study, Lim says the population within a 5km radius of the Tigaman Square development stood at 426,706 people in 2010 and is expected to grow to 626,311 by 2015. He says a population of 626,311 people matches that of Petaling Jaya, which has over 520,000 people currently. There are those who argue that the PJ population is relatively more affluent, but Lim disagrees. 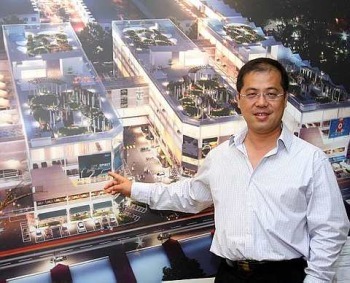 Lim also argues the fact that Bukit Kemuning, as a predominantly industrial area, would augur well for a retail outlet. “An operator of an industrial lot would need to be more affluent than a shoplot operator. If an area is classified as an industrial area, there should be more affluent people there. And at this point, they don't have anywhere to go to spend their money,” Lim says, adding that Tigaman Square would be the only retail outlet of its kind within a 5km-10km radius. Lim says the company is also banking on the lack of retail developments in the vicinity for the project's success. He says the nearest retail or shopping outlets such as Plaza Alam Sentral or PKNS complex (Shah Alam), Jusco Bukit Tinggi (Klang) or The Summit (Subang Jaya) are all more than 5km away. He adds that Tigaman Square will be easily accessible via major roads and highways like Lebuhraya Kemuning-Shah Alam and Kesas Highway. The retail portion of Tigaman Square will comprise mostly food and beverage (F&B) outlets or between 35% and 40% of the total retail tenant mix, says Lim. “With over 400 factories within the area, we also want to target factory workers who can come here and have their lunch,” he says. Lim says a wide mix of F&B tenants will be chosen so that they would complement each other rather than compete with one another. “About 20% of the total retail space has been taken up and will hit 90% by the time the project is completed. Sunhor recently had a ground-breaking ceremony for the Tigaman Square development and the project is slated for completion by 2013. “Most commercial projects take three years to complete but we want to build everything in two years,” says Lim. Located on 7.69 acres of freehold land, Tigaman Square is expected to have a gross development value (GDV) of RM240mil. “We expect it (GDV) to be more by the time the project is completed,” Lim says, adding that prices of its units are “competitive” compared to its nearest competitors. The offices will be partly furnished by Signature Kitchen, a leading player for branded modular kitchens. Tigaman Square will also feature alfresco dining and roof gardens. “We want to make it as vibrant as possible. At the end of the day, it's about keeping it interesting,” Lim says. KUALA LUMPUR: Mah Sing Group Bhd won big at the NST Property Awards last night. Group managing director/group chief executive Tan Sri Leong Hoy Kum was named Property Man of the Year and the group bagged the Best Lifestyle Developer award. Held for the second time, the NST Property Awards saw the newspaper's property section, Property Times, honouring five nation builders at the Editor's Choice Awards. The categories were Best Economic Redevelopment Zone, Best Broadband Utility, Best Property Management Company, Best Project Management Company and Best Real Estate Investment Trust. The recipients were Sepang Gold Coast, Telekom Malaysia Bhd, Sunrise Bhd, Andaman Property Management and Sunway Bhd respectively. 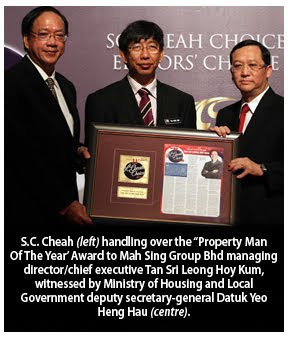 Meanwhile, the second S.C. Cheah Choice Awards, named after the veteran property journalist and NST Property Eyes columnist, saw 12 awards given out. Recipients included Nadayu Melawati for Best Boutique Bungalow Development; K Residence KL for Best Luxury Residential Highrise Development; Ivory Properties Group Bhd for Best Penang Developer; Sagajuya (Sabah) Sdn Bhd for Best Sabah Developer; Superboom Projects Sdn Bhd for Best Perak Developer; Platinum Park for Best Iconic Development (by Naza TTDI Sdn Bhd); and The Haven Lakeside Residences for Best Resort Condominium (by The Haven Sdn Bhd). KUALA LUMPUR: Iskandar Malaysia is set to receive some RM2 billion investments from a Beijing-based real estate developer. Zhuoda Real Estate Group yesterday signed two memoranda of understanding with Iskandar Investment Bhd (IIB) to buy land and develop mixed residential and commercial projects in Medini, IIB's flagship development in Iskandar Malaysia. The first deal is for the development of a residential project at Medini North, with Zhuoda buying a plot of land there for US$53 million (RM158 million) and investing another US$389 million (RM1.2 billion) to develop it. The second one is for Zhuoda to lease 40,000 square metres for about US$24 million (RM70.8 million) and invest another US$169 million (RM520 million) to develop it. "The definitive agreements are scheduled to be signed at the 3rd World Chinese Economic Forum in Kuala Lumpur on November 3," IIB said in a statement released in Beijing yesterday. The project in Medini North, the leisure and tourism destination in Iskandar Malaysia, will be a joint venture between IIB's subsidiary Medini Iskandar Malaysia Sdn Bhd (MIMSB) and Zhuoda. To be 80 per cent owned by Zhuoda, the joint-venture company will build residential units on about 73,000 sq m site. IIB president and chief executive officer Datuk Syed Mohamed Syed Ibrahim said this is the first major investment by a Chinese property development company in Iskandar Malaysia. "Bilateral trade between China and Malaysia is expected to rise to at least US$80 billion (RM239.7 billion) in 2011 and IIB's partnership with Zhuoda will further support the efforts by both governments in promoting two-way investment between the two countries," he said in the statement. Zhuoda chief operating officer Yang Han Qing said the company, established 18 years ago, has a total asset value of US$7.8 billion (RM24.1 billion) and net asset value of US$6.6 billion (RM20.2 billion). "This signing is a milestone for Zhuoda's initial overseas investment and a landmark in Zhuoda's history to become a globalised company," Yang said. According to the Iskandar Regional Development Authority, Iskandar Malaysia has recorded a total cumulative investment of US$25 billion (RM75.96 billion) from November 2006 to June 30 2011. Foreign investments accounted for 40 per cent of this amount. PETALING JAYA: Berjaya Land Bhd (BLand) posted a huge year-on-year dip in net profit to RM1.88mil for its first quarter ended July 31 from RM44.5mil in the corresponding quarter last year. This was attributable to lesser profit contribution from its hotel and recreation business due to lower occupancy rates, and reduced sales from the meeting, incentive, convention and exhibition sector (MICE). “The lower profit was also due to the impairment of available-for-sale quoted equity investments as well as unfavourable changes in fair values of quoted equity investments,” BLand told Bursa Malaysia. It should be noted that the results of the preceding year's corresponding quarter included an exceptional gain on the disposal of an associated company amounting to RM53.2mil. In terms of pre-tax profit, the quarter under review recorded RM94.8mil against RM112.4mil a year ago. BLand achieved RM1bil revenue in the quarter compared with RM978.9mil in the period a year ago. The higher revenue was mainly contributed by its gaming business via Berjaya Sports Toto Bhd's principal subsidiary, Sports Toto Malaysia Sdn Bhd, and the improved sales registered by its property development division. CIMB Research said BLand's property EBIT (earnings before interest and taxes) plunged 82% year-on-year to RM1.6mil due to poorer margins while the hotel EBIT fell 6.4% year-on-year to RM9.9mil. The brokerage said the potential downside catalysts for BLand's share price performance were the poor first-quarter results, execution risks for its overseas projects and continuous losses for its club division. CIMB Research maintained its “sell” call on BLand shares with a target price reduced to 93 sen from RM1.11. The counter closed 2 sen higher to 95 sen yesterday. PETALING JAYA: SP Setia Bhd is expanding its landbank in Australia through subsidiary SP Setia International Ltd with an investment of RM81mil for its second property project in Melbourne. The project has an estimated gross development value of A$250mil (RM772mil). It told Bursa Malaysia that SP Setia International had entered into a contract of sale with Portbridge Pty Ltd to acquire the freehold land.